Photo credit: Climate Action Network International. 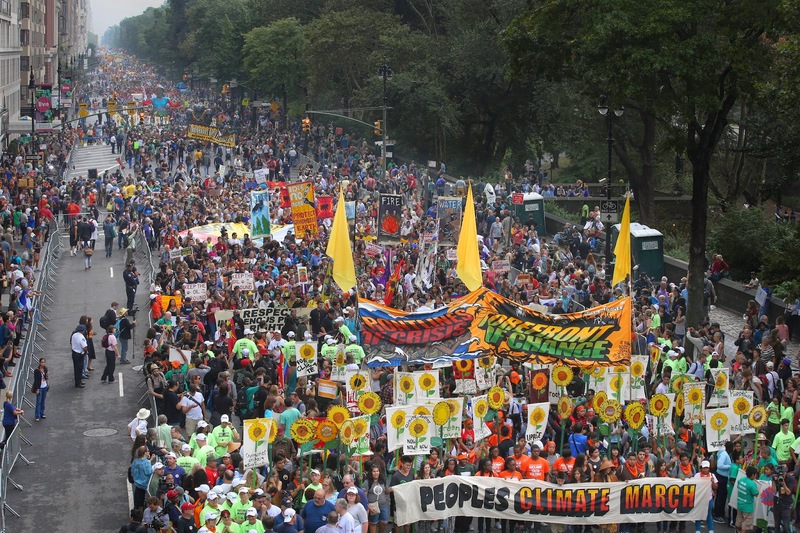 Something quite remarkable happened in New York City last month, more precisely on the 21st September 2014 as an estimated 400,000 took to the streets to demand action on climate change. This not only dwarfed any other climate protests that were taking place around the world in a global weekend of protests that were happening in the run up to the New York climate summit hosted, by UN Secretary General Ban Ki-moon, but it also became the largest climate march that has ever taken place. It showed that the large climate movement that has been underway for some time in the US is now gaining strength and that the climate impacts the US is experiencing, and peoples anger that the fossil fuel industry moving closer and closer to their homes, is being transformed into the biggest climate movement the world has ever seen. This is despite the fact that climate denial and misinformation still are rife in the US, mainly perpetrated by the Republican Party, the fossil fuel industry and large parts of the media. But some progressive news outlets such as the New York Times, Washington Post, the Huffington Post as well as a dozen online news sites combined with clever social media campaigns have meant that more and more Americans are taking the climate threat seriously. Several events have contributed to the fact a growing number of Americans see climate change as a bigger and bigger threat. First of all the rise of extreme weather events are exploding. From unprecedented droughts in Texas, California and Washington State to an increase in violent storms, flash floods, landslides and hurricanes. Hurricane Sandy for instance has transformed the way people view climate change on the US East Coast. Secondly, people are becoming increasingly angry at how the fossil fuel industry are moving closer to their lives, with the shale gas boom being the perfect example. People are worried about pollution, increased industrialization and chemicals polluting groundwater reserves as well as climate change. There is no doubt that the anti fracking movement has played a large part in forming this new climate movement underway in the US. Indigenous groups are joining the movement too as they witness the fossil fuel industry taking over the land they have lived off for generations, while the impacts of climate change also makes their livelihoods harder. They are looking with horror at what has happened to Indigenous groups in neighboring Canada; there they have had to make way for the powerful tar sands industry and some have paid with their lives as this fossil fuel industrialization have meant a higher increase in cancer rates and heart diseases. On the financial side people see the fossil fuel industry as central in distorting politics and contributing to a more unfair society. They are feed of with fossil fuel magnates such as the Koch Brothers, some of the wealthiest Americans buying themselves political influence. The now global and highly successful fossil fuel divestment campaign was started in the US. Just before the New York climate summit started, the Rockefeller Foundation which was built on oil wealth announced they would divest from fossil fuels and invest in clean energy instead. Vitally, a growing part of the business community see it as economic sense to deal with climate change. There is a strong argument that taking action on climate change is good for the economy and more and more businesses add their names to the growing list that are supporting strong action and policies on climate change such as enforcing a carbon tax. Celebrities like Leonardo DiCaprio, Edward Norton and many others who took part in the record breaking march are playing a central role in encouraging action, and are carrying the climate message much wider that it otherwise would have travelled. For instance the Hollywood Reporter has reported on the issue because of Leonardo DiCaprio, and many other publications have picked up the story for that reason alone. The strength of the US climate movement is its diversity and it’s more than just a group of left wing protesters, it’s represented in many demographics, and all walks of life and it is precisely those ingredients that makes a movement grow and makes it matter. The good news is that it shows no signs of slowing down – quite the opposite in fact.